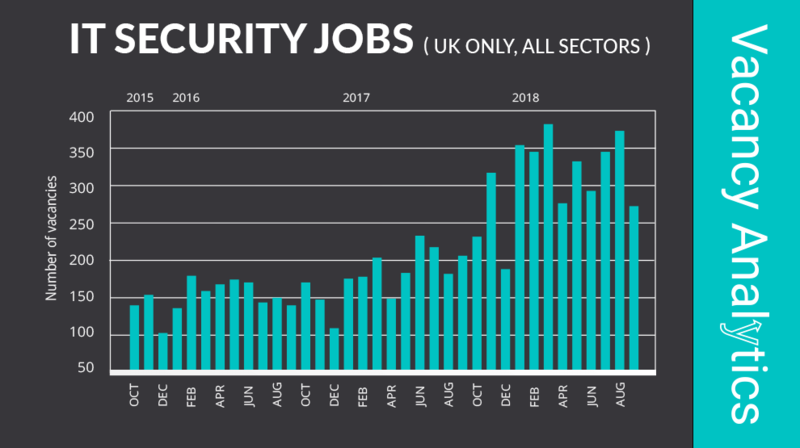 Given Gartner forecast that worldwide IT security spending will reach over $100 BN shortly, it is perhaps no surprise that vacancies have nearly trebled over the past three years. While a significant proportion of this increase has been in banking, this is not the only area. Actually the area which has grown the most is Consumer Goods & Services, as personal data becomes more valuable, businesses which traditionally were more lax in their IT security have been forced to step up. Recent scandals involving high profile hacks, from wannacry holding the NHS to ransom, to other well known instances, companies have realised that improving their IT security is no longer an option, especially as GDPR starts to take effect. There has also been a marked increase in vacancies for Data Protection Officers as well, where data compliance for GDPR is becoming one of the fastest growing areas this year.